With Spring just around the corner, you must be getting ready for the Easter bunny to come hopping over. To help celebrate Easter this year, PLAYMOBIL has adorable new 2015 PLAYMOBIL Eggs out just in time for the basket filling. Fun PLAYMOBIL figures are hiding inside each Egg guaranteeing creative play for both girls and boys. 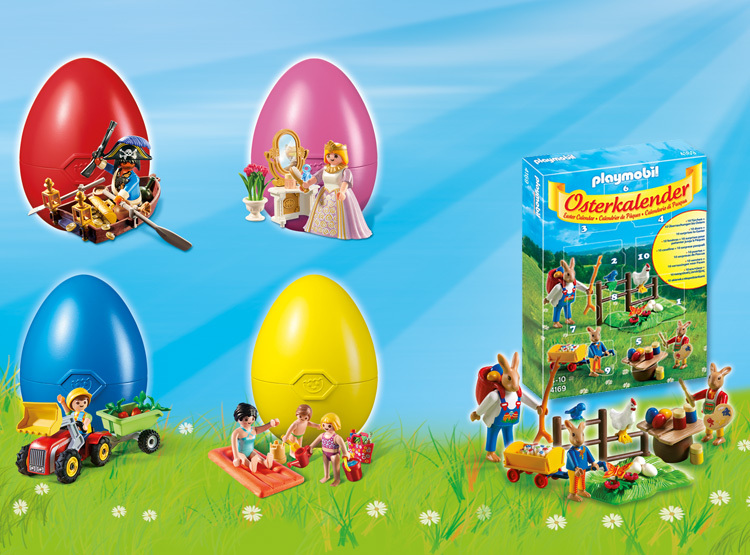 With various exciting themes, the PLAYMOBIL Egg is the perfect addition to this year’s Easter Basket. The Possible Eggs include: Princess with Vanity Station, Fun at the Beach, Pirate with Rowboat and Boy with Children’s Tractor. The PLAYMOBIL eggs are available for purchase on the PLAYMOBIL USA site and at specialty retailers for $9.99. One of you can win an egg of your own- please feel free to enter using the RC form below. Good luck! Ends April 10, 2015. I’d give to my daughter. I would give this to my son. He loves Playmobils! I would hide it in the yard and let one of my kids find it. My son! He loves legos and is obsessed with egg surprises. I would pick the yellow beach day and add it to my granddaughters Easter basket. My daughter would be the one I give this to. She loves toys like this. This would go to my older son who is really into playmobile right now. I’d put this in my son’s easter basket! I would give this to my youngest child. My youngest son would love these eggs. I’d like this for my 6 yoa niece. Thanks. I would give this prize to my grandson! I would give it to either one of my grandkids! I would like to give this to my 7yr old. I would give it to my niece. She has a few Playmobile sets and I know she would love to add to her collection.